Stocks tumbled Friday as trade tensions between the United States and China heated up. The Dow closed down 572 points, a drop of 2.3%, after President Trump threatened to escalate a confrontation with China over trade. It fell as much as 767 points earlier in the day. The S&P 500 and the Nasdaq each declined more than 2%. Friday's losses wiped out gains for the week, and the Dow sank back into correction territory — 10% below its all-time closing high in January. Trump said late Thursday that he was considering tariffs on $100 billion more in Chinese exports, which would triple what the United States is already planning. "The fear of a policy mistake on trade is increasing," said Art Hogan, chief market strategist at B. Riley FBR. All 30 companies on the Dow lost ground on Friday. Caterpillar (CAT), Boeing (BA) and Nike (NKE), giants with heavy exposure in China, were among the biggest losers in the index. "The ratcheting up of trade tensions clearly carries risks. The tariff threats, even if only intended as bargaining tools, will be difficult to back down from if talks fail to deliver results," Capital Economics' Julian Evans-Pritchard wrote in a research note Friday. Anxiety returned to Wall Street after three days of gains. The VIX, (VIX) a measure of market volatility, spiked 12%. CNNMoney's Fear and Greed index sank further into "extreme fear" territory. Wary investors had been holding out hope that the two sides will reach a deal before the proposed trade barriers go into effect. White House officials, including top economic adviser Larry Kudlow, have sought in recent days to soothe business leaders' fears of a trade war that would constrain economic growth. 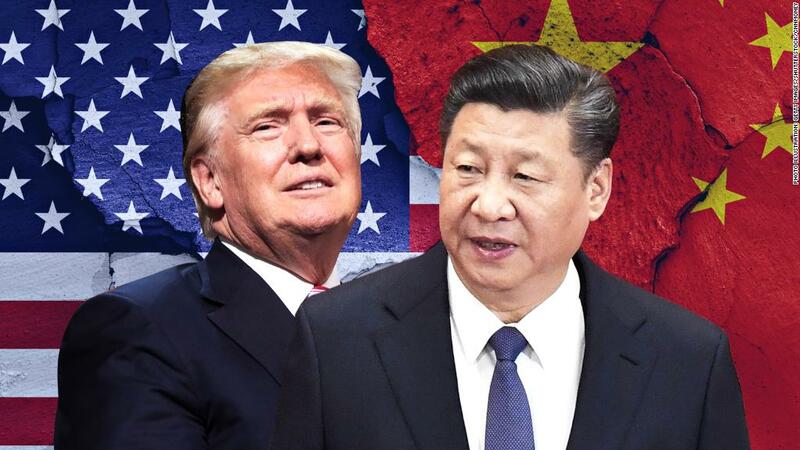 Earlier this week, the Trump administration announced plans for tariffs on $50 billion worth of Chinese goods in retaliation for China's alleged theft of US intellectual property. Beijing fired back hours later by threatening tariffs on $50 billion worth of US goods, including cars, planes and soybeans. The market had been interpreting Trump's proposed tariffs as negotiating tactics meant to extract concessions out of China rather than a rigid position. But Wall Street began to reassess that view as the administration sent conflicting signals throughout the day. "We've gone from Larry Kudlow trying to calm the markets down to the administration saying, 'Hey, ignore the markets,'" Hogan said. In a radio interview Friday morning, Trump said, "I'm not saying there won't be a little pain, but the market has gone up 40%, 42%, so we might lose a little bit of it." Kudlow, speaking to reporters shortly after the markets opened, said, "Now, we're not running a trade war." He stressed that the US tariffs on China were simply proposals, still to be vetted by trade officials and open to public comment. Selling accelerated later in the day after Treasury Secretary Steve Mnuchin told CNBC, "There is the potential of a trade war." Investors had been operating under the assumption China and the United States were negotiating to avoid a trade conflict, but Mnuchin avoided questions about whether the two countries were actively talking. "As no one came out to pull this back, there was a gradual realization that this was something that might be a little more serious," said Brad McMillan, chief investment officer for Commonwealth Financial Network. Analysts said the market also responded to Federal Reserve Chair Jerome Powell, who said that the US economy was growing and a turbulent stock market would not change the Fed's course to gradually raise interest rates. The Fed is on track to raise rates three times this year, but it could speed up the increases to keep the economy from overheating. "Markets are forced to confront the idea that rates are going up and the stock market is not going to derail that process," McMillan said. Stocks were mostly unaffected by the March jobs report, which showed that the US economy added 103,000 positions, down from a much bigger gain in February and well below what analysts were expecting. Wages grew 2.7% in March compared with a year earlier, in line with expectations. Investors were watching that number because it's a barometer of inflation. In February, an unexpected jump in wage growth set off inflation alarm bells and caused stocks to plunge. The combination of the hiring slowdowns and modest wage growth temporarily eased Wall Street's concerns that the economy was getting too hot. The yield on the 10-year US Treasury note, which has been steadily climbing as investors' inflation expectations rise, dipped to 2.78% after the jobs report. "Investors breathed a sigh of relief," said Sam Stovall, chief investment strategist at CFRA Research. "Now we only have one issue to deal with, and that's trade." —CNNMoney's Paul R. La Monica contributed to this report.